Sway U16s beat close rivals Fawley in a pulsating 18-over cup final on Sunday that was only played thanks to the magnificent efforts of the Langley Manor CC ground staff preparing a playable wicket from a quagmire. Sway won the toss and asked Fawley to bat on a damp track. After four tight opening overs from spin twins Daniel and Joshua Bailey the Fawley opening pair of Bailey Parratt and Max Bowen began to increase the run-rate until some sharp fielding from Thomas Clowes removed Bowen run out for 10. Parratt (32) and Bainbridge (21) then steadily advanced the Fawley innings with some big hitting despite some inspired ground fielding from Sway with Anthony Rogers, Joe Zani and D.Bailey all making some amazing boundary saves. At 67-1 off 10 overs Fawley looked set for a big total when D.Bailey had the plundering Parratt well caught off a top edge by wicketkeeper Burton. The next over Sway played their trump card as 12-year-old David Elford took the ball. 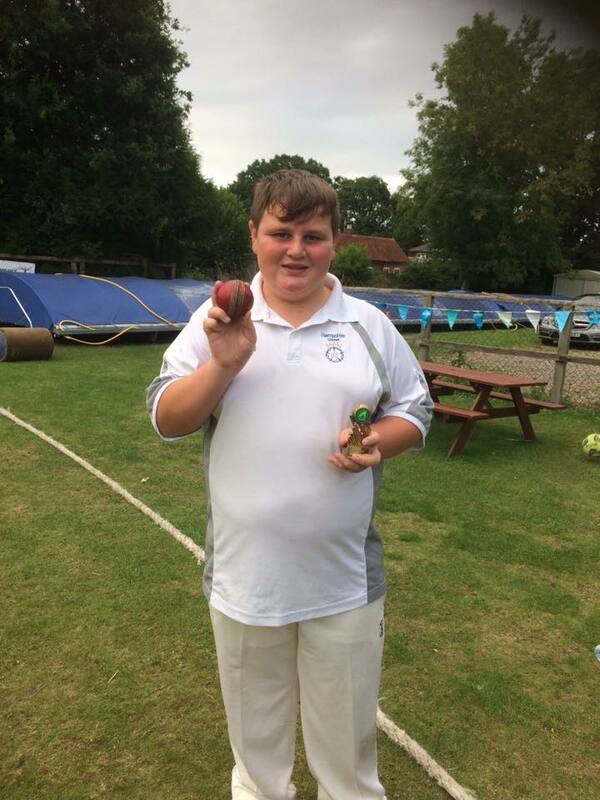 On a slow and low wicket his brand of line and length seam bowling blew away the Fawley middle order as he took 5 wickets for 14 runs in just 3 overs, one to a fine boundary catch from Rogers but the rest bowled or LBW. Both Baileys and Bradley Balcombe each chipped in with a wicket but it was Elford's magical spell that reduced Fawley to 98 all out in the 18th over. Sway's opening pair of skipper Tom Burton and Dan Bailey knew that sensible batting on a sticky wicket was the recipe for victory. They started playing straight, finding the gaps in the field for 1s and 2s and seeing off the impressive left arm spin of B.Parratt before gradually increasing the tempo and striking boundaries with some power-hitting. Burton retired at 40 n.o. in the 11th over and D.Bailey retired just one ball later on 43 n.o. with the score on 93. That left J.Bailey and Freddie Pearson to see Sway safely over the line to a 10 wicket victory in the 13th over. This was a tremendous team effort from Sway against worthy opponents from Fawley in a match played in great spirit where the margin of victory does not really reflect the close-fought nature of the match. Sway u16 New Forest Cup winners.